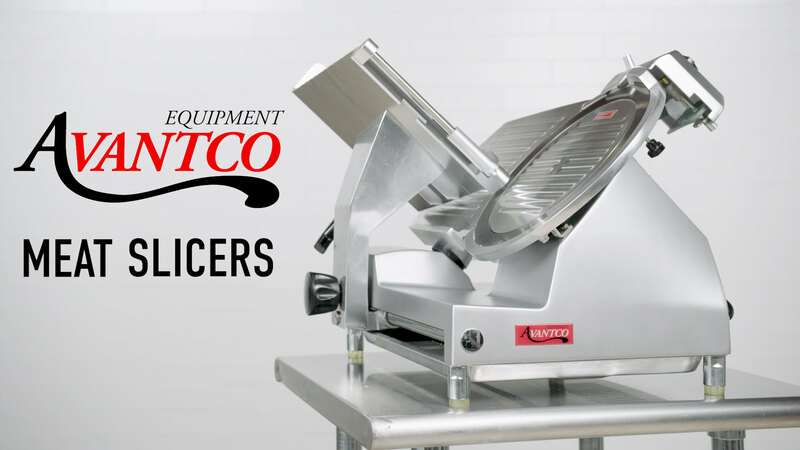 This Avantco SL310 10" manual gravity feed slicer features a compact design that's ideal for small operations where space is at a premium! It's great for slicing vegetables and processed meat, and it's easy to use with an adjustable slice thickness from 1/16" to 1/2". 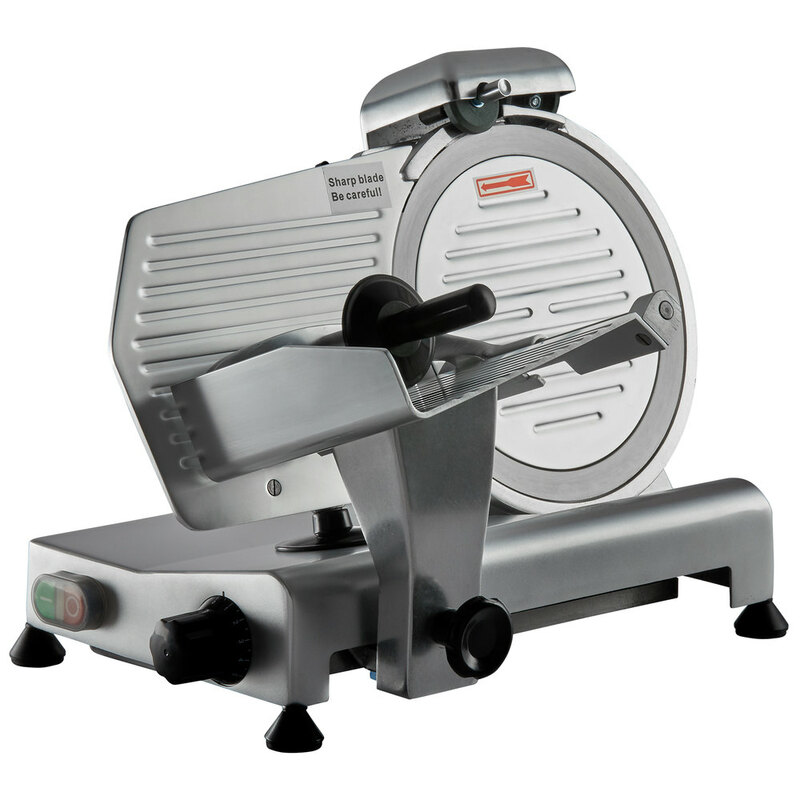 The Avantco 10" slicer is made of top quality aluminum for durability, and it comes with a built-in sharpening assembly. 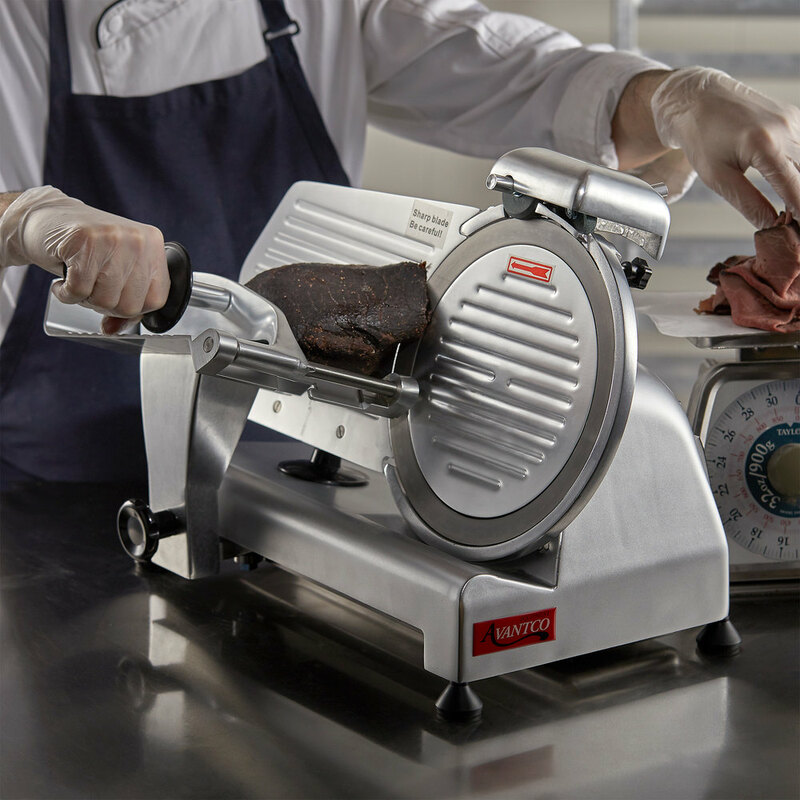 For easy cleaning, the meat carriage is removable, and it also has a fixed ring guard for safety. 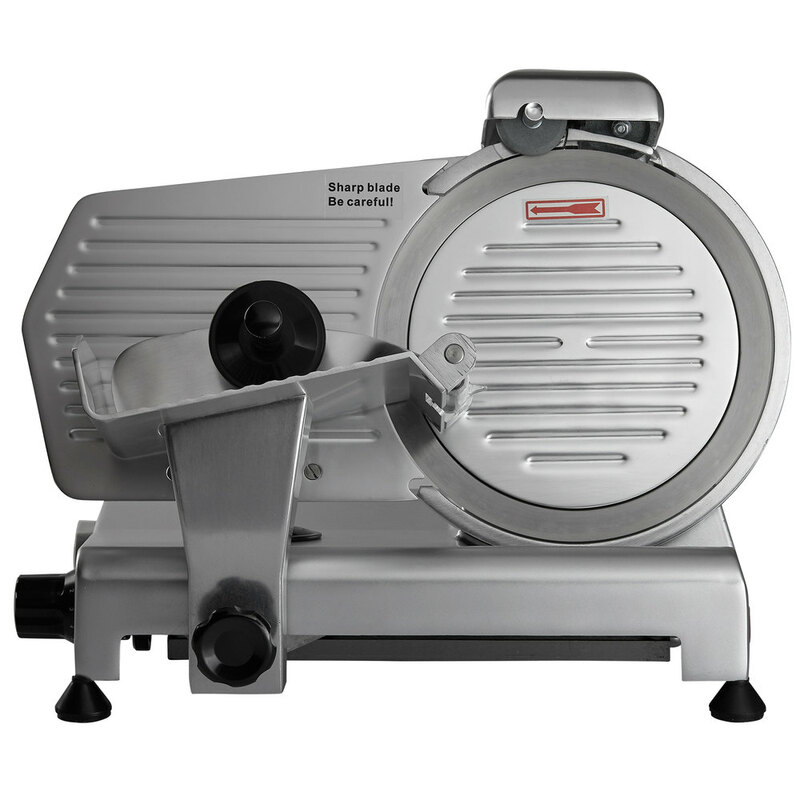 The slicer's stainless steel blade is belt-driven by a 1/4 hp motor. This slicer is excellent for low-volume applications of less than 1 hour of slicing per day. It is not suitable for continuous heavy use, raw or frozen meat, or cheese. Maximum Product Size: 8" x 6 1/2"
Great value for the price. This slicer handles all of our meat and cheese plate needs, plus cuts thin for great deli sandis and has handled everything we have thrown at it. Really great meat slicer if you're establishment that isn't a super high volume when it comes to sliced meats. 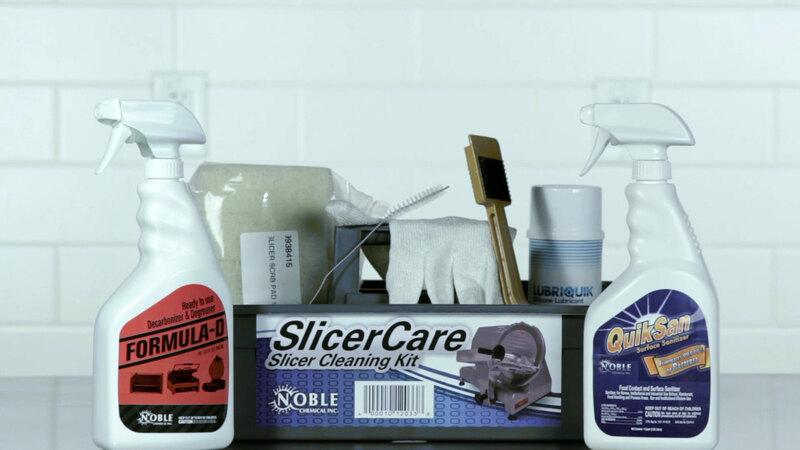 The blade comes razor sharp and is very easy to clean. This meat slicer works great. It is very easy to clean and it fits perfectly in our small kitchen. It is even sharp enough to slice bread if we need it. After burning out a few cheap slicers this one has held up and worth the price. We make our seitan in house so we do not use meat on it but the seitan is firmer then meat and it makes the most beautiful slices. Easy to take a part and clean. Nice, durable and compact, this meat slicer works like a charm. The blade is so thin and very sharp that I nicked myself pretty bad on the fourth usage. A nice clean cut. Overall, a good equipment. After several years of using this slicer I would still highly recommend it. Blade stays sharp for extended periods of time and cleans fairly easy. Only thing is that I should have researched was the length of the glide. It works perfect for summer sausage and small items but does have some issues with wider items such as bacon. This is the best slicer for the money on the market. Super easy to clean and maintain. Use it daily and it holds very well. For the price, it’s fantastic, very sharp blade, easy to clean ,!we slice our lunch meats, and it’s mobile. Light weight and easy to use! You really do get what you pay for. One of the main drawbacks of this machine is that it is really difficult to clean due to the construction. Perfect size for my restaurant. This product does exactly what is promised and never let me down. Lookng forward to using it more throughout the years. It is a pretty basic slicer. It is much smaller than a typical slicer, so I would only recommend it for someone who needed to use it very infrequently. You can barely fit a turkey roll on the slicer. Other than its size it is a decent slicer. I give it only 3 stars as I think most commercial businesses would need a larger slicer. It is a bit impractical. The slicer came on or between the days it was said to arrive. Everything was perfect.. small amount of assembly was required. Used the slider the very next day to slice a whole deli turkey and a black forest ham. WORKED PERFECTLY. Time it was used was around 45 minutes total, No problems at all. Great slicer. It is easy to clean and easy to work. Blade stays sharp and have never had a problem with it. Wish the power plug was longer. Very robust slicer. It came properly packed. We use it mainly to slice ham and corned beef. So far it has done an splendid job. The edge is very sharp. We've been using this slicer now for 9 months or so, nearly daily, and I have been pleasantly surprised. It's stood up well, and cuts without issue. They only thing I wished, is it came apart easier for clean up, but it's still 5 stars in my book. Man! What a valuable piece of equipment. We don't have the highest volume of deli meat to slice, but for the price of this slicer we are so happy with our purchase! The price simply cannot be beat. Very nice compact slicer to get the job done for what we use it for. Cleanin could be a bit easier but overall great product. We needed a smaller meat slicer for our small golf course kitchen and westaurant had the perfect one. I have been using it for a few weeks now and love it. I read reviews about how hard it was to clean, but i didn't mind the clean up. Very nice meat slicer for a medium sized restaurant. We went from a 12" slicer to this 10" slicer and it has been a positive change which saved us a lot of money in the cost of a slicer. This is a fabulous product! Easy to use. Easy to clean!! We purchased the 10 inch size and are extremely satisfied. From ham capoy to roast beef it fits our needs!! Not a bad deal. It is a bit tedious to clean but it gets the job done as a low usage machine. We don't cut that much meat and it easily handles that. This Slicer is okay. It's not for heavy everyday use but can get the job done and as most have said it is difficult to clean. Product works great. Easy to use and takes up limited shelf space during storage. I just wish the cleaning process was a little more efficient, but I don't know any slicer that's easy to clean. Love this slicer. We have used it three times since we purchased it, it is so quiet and slices great. It's a little hard to clean but we are figuring it out the more we use it. Very light weight for easy portability in the kitchen. Only small pieces of meat can be used at a time with such a small area for cutting. Great for slicing produce like tomatoes or pickles. Cleaning is a chore and difficult to get into the nooks and crannies. Blade arm moves well, but you need to anchor the slicer or it will move with you. Item was shipped and delivered quickly. Slicer works well for the size of cafe we run. The clean up process is a bit tedious though. I cannot believe the value of this slicer! It cuts meats easily, easy to clean and works perfectly in our small kitchen space. Highly recommended!